The pre-shredding system can be equipped with bolted cutting tools to minimize the operational cost and simplify maintenance of the line. Two-stage rasper system effectively liberates the steel from the rubber enabling effective separations and the production of clean wire. The fine granulation system is equipped with a special rotor designed specifically for tire rubber size reduction. It provides maximum throughput, whilst minimizing the amount of fines created. The machine is also optimized for low operational and wear costs. Textile and dust is aspirated at several positions of the recycling system. A central Reverse Jet Filtration System extracts dust from the entire system. 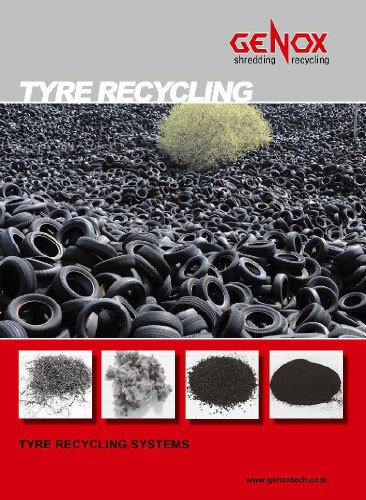 Our Milling System can be installed at the back end of the tire recycling system. The size and configuration of the Milling System is configured according to the specific production requirements i.e. size and throughput. Advanced sound attenuation enclosures can be provided to reduce the noise level of the system to < 85dBA. Water spray & misting systems are installed on key components to maintain processing temperatures at safe levels and to protect against fire. System automation ensures that components actions are linked, the system capacity is maximized, and the system is protected against interfering material in the best way.